The study of the Danakil Depression, Dallol or the saline Lake Afrera is likely to allow us to better understand or analyze exotic places on Mars or Titan. The Danakil Depression, located in Ethiopia, represents an extreme environment where life has to withstand high temperatures, a high level of acidity or an hostile chemistry. That's why the area is a perfect place to study extremophiles. The hostile region of the Danakil Depression is also reminiscent of Io, the active moon of Jupiter whose surface looks like a pizza in terms of texture from outer space. A parallel can also be drawn between the conditions found in the Danakil Depression and the conditions found in sites made of nuclear waste. A few months ago, from January 20 to January 28, 2018, five groups of scientists and more than 30 support staff explored two places in the area to analyze the microbiology, the geology and the chemistry at the Dallol hydrothermal outcrop and the saline Lake Afrera in northern Ethiopia. The expedition performed by the scientists was supported by the Europlanet 2020 Research Infrastructure (RI) financed by the EU. The Europlanet 2020 Research Infrastructure has organized several field campaigns over the past two years to carry out a comparative analysis between the environment of the region and the environment of other planetary bodies and to improve our knowledge or understanding in terms of biology or exobiology. The famous volcano Dallol, located in the Danakil Depression in Ethiopia, has been explored by the researchers Karen Olsson-Francis and Vincent Rennie from the Open University who study the ecosystem of that hostile environment. Dallol has a particularly low elevation since its mean elevation is lower than the sea level. The ground can be more than 100 meters below the sea level. Organisms or microorganisms in the environment of Dallol must be adapted to the extreme conditions which are characterized by high temperatures, an extreme salinity and an extreme acidity. The area is clearly active with upwelling water heated by magma near the ground. The liquid contains a large concentration of many different salts. The scenery is remarkable with brightly-colored, highly acidic lakes or pools. It is hard to breathe in that environment since there are toxic gases such as chlorine and sulfur vapor in the air close to the surface. Karen Olsson-Francis and Vincent Rennie want to know how the microorganisms present in the hostile environment of Dallol adapt to physical and chemical changes in the area. They also want to know the limits of habitability and to determine the location of the pockets of habitability. They analyzed two channels composed of highly acidic, saline water whose temperatures oscillate between 40 degrees Celsius and 70 degrees Celsius. Both scientists carried out measurements on-site and gathered samples for further studies in the laboratory. Vincent Rennie pointed out: « Our initial findings showed that microbes may be present, despite the extreme salinity and acidity.» The collaborators will now begin to perform new geological and microbial analyses in the coming months. If all goes well, they may obtain preliminary results of the outflow channel analyses by early September. Another team of researchers composed of Hugo Moors and Mieke De Craen of SCK-CEN also analyzed the ecosystem or the microorganisms present in the hostile environment of the Danakil Depression. The environment of Dallol is really special in terms of geology, chemistry and biology. Hugo Moors and Mieke De Craen studied several pools or pockets of water and managed to test a series of new sampling techniques and sample preservation systems. Hugo Moors and Mieke De Craen have performed some studies in the field of astrobiology on the basis of our work on exoplanets and on the basis of the Habitable Zone concept. The Danakil Depression represents an experimental site to study the behavior of extremophiles in a particularly hostile environment. Can those microorganisms thrive in nuclear waste ? Hugo Moors advanced : « The extreme conditions in the Danakil Depression might resemble some of the conditions encountered in the disposal of waste from nuclear reactors. We will now try to cultivate microbes and chemically analyse samples of the water from Danakil to attempt to understand what might be able to survive in nuclear waste.» Normally, the typical organisms found on Earth are fragile and can develop cancer if they are exposed to excessive levels or radioactivity. But some microorganisms may be capable of thriving in an environment rich in radioactivity. Thus, can there be life on the surface of Io for instance ? A parallel between rift zones on the Red Planet Mars and the Afar rift can be drawn. Next summer, the ExoMars Trace Gas Orbiter will start an analysis of rift zones on the Red Planet. Those rift zones reveal salt deposits and ancient magma systems. They unveil a strong resemblance to the Afar rift that is developing between the Erta Ale and Dallol volcanoes at the present time. A preliminary research work upon the structure of hydrothermal systems has already been performed by Daniel Mège of the Polish Academy of Sciences and Ernst Hauber of DLR. The team collected soil samples from several centimeters beneath the surface in order to identify the microbial life evolving there. Daniel Mège argued : « We need to analyse our findings, but some of the preliminary results look very exciting.» He added : « We've also carried out reconnaissance work for a ground magnetic survey next year, in which we aim to characterise intrusive magmatic activity in the rift. We look forward to returning in 2019.» Mars may have been habitable in the past with seas or oceans of liquid water. There is not the right combination of atmospheric pressure and environmental temperature for the presence of liquid water on the Martian surface today. Another team of researchers composed of Jani Radebaugh of Brigham Young University and Ralph Lorenz of the Johns Hopkins University Applied Physics Laboratory resorted to a handheld digital camera and to a « kite-cam », a kite-lofted GoPro, to generate Digital Elevation Models (DEMs) based on the images taken at a variety of places across the playas and other areas in the Afar. They have collected 15 different image datasets in different places. Those views will then be compared to RADAR data related to the roughness of the ground. Jani Radebaugh pointed out : « This region is absolutely spectacular for field work from a planetary perspective, as there are so many unusual and extreme environments that have strong planetary analogues.» She added : « The comparison of our datasets gathered on the ground with RADAR images taken from space, which quantify roughness in a different way, will help us interpret data from space missions on the roughness of surfaces at Titan and Mars.» The Radar Mapper of the Cassini orbiter had obtained numerous radar views of Titan's surface revealing lakes, seas, rivers, dunes, canyons or mountains. We have to compare radar views of Titan with radar views of the Earth in order to better understand what we see on Titan. Another team of researchers composed of Felipe Gomez, Nuria Rodriguez and Beatriz Flores of CAB-INTA put their skills in the preparation of the Danakil area in the prospect of comparative planetology for Europlanet 2020 RI's transnational access programme which brings a financial support to scientists to explore and study the area and to perform experiments. Felipe Gomez argued : « The diversity of the research carried out by these five teams shows the versatility of this exotic landscape for planetary research.» He added : « We have already had interesting findings about the preservation of organic matter under such harsh conditions, which gives important clues about martian habitability. Any scientist can now apply to carry out planetary experiments at Danakil. We look forward to seeing the results !» There are extinct volcanoes on Mars today. The Red Planet hosts Olympus Mons, the largest volcano in the Solar System. Can we find archaea or extremophiles there ? Gian Gabriele Ori of the International Research School of Planetary Sciences in Pescara and who led the mission in the Danakil Depression area pointed out : « In visiting Danakil, we have purposely brought together people from different parts of the world to encourage the sharing of ideas across institutions, countries and continental boundaries.» He added : « Seasoned researchers have worked side by side and shared their experience with young scientists. It has been a very successful trip. » The exploration mission involving the research work benefited from the support of Monica Bufill and Daniela D'Alleva of the International Research School of Planetary Sciences in Pescara, Italy, Miruts Hagos from Mekelle University and Mikael Tamrat and Zablon Beyene of Zab Tours Ethiopia. The group of researchers was accompanied by the photographer Alex Pritz. Dallol can tell us a lot about extreme environments like the environment of Venus, Mars, Io or Titan which may have an active interior. The image in the upper part of this table reveals the area of Dallol in Ethiopia. 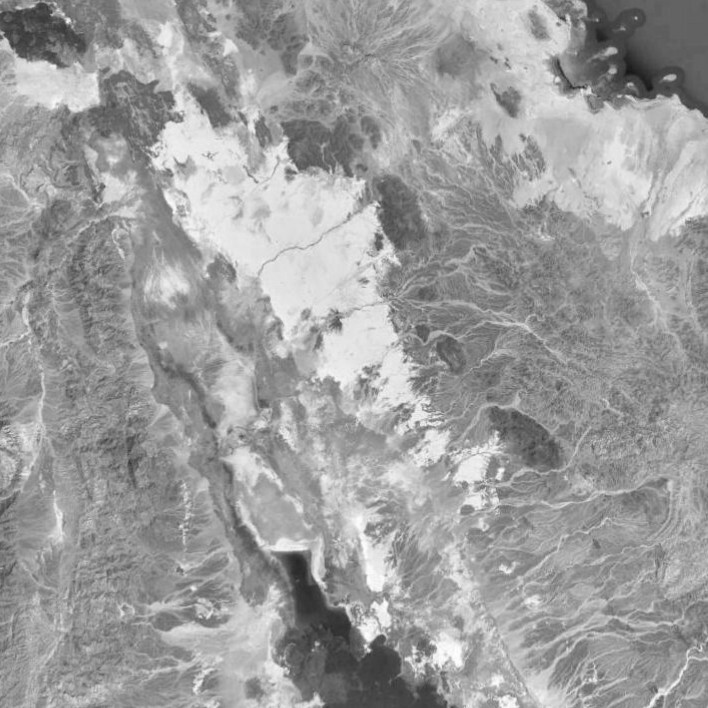 The view corresponds to a black-and-white portion generated on the basis of a Google Earth view. The portion is 100 km wide and 100 km high. The image in the lower part of the table represents a radar portion of a radar swath of Titan's surface taken from the Cassini spacecraft on October 26, 2004. The radar portion of Titan's surface is 100 km long. Therefore, the scale is the same for each image. 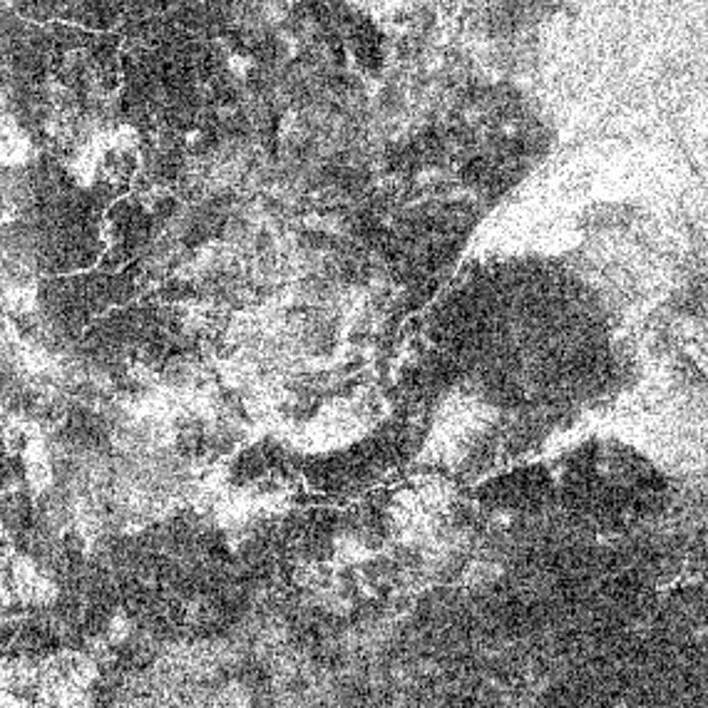 The radar view of Titan's surface unveils brigh and linear features which may be related to a cryovolcanic activity. Can we find similarities between that area and the area of Dallol or the Danakil Depression ? Credit for the original view of the Dallol area: Google Earth. Credit for the radar portion of Titan: NASA/JPL/Cassini Radar team/Jason Perry. Credit for image adjustments: Marc Lafferre, 2018. - To get further information on that news, go to: https://www.astrobio.net/also-in-news/extreme-environment-of-danakil-depression-sheds-light-on-mars-titan-and-nuclear-waste.